When you are in the village you will probably want to visit the local temple. This is an important step to understanding the customs and traditions of the people in Isan. You are expected to wear appropriate clothing, when in doubt ask Manida. There are several possibilities to make an offering (tambun). The idea of tambun is that giving something to the community, a monk or the temple is a good thing, also for yourself. You can ask something in a short prayer or think of a wish, this can be material (money, a new house etc.) or immaterial (good luck, good health or for example peace in the world). Did you watch the youtube movie of Homestay and Guesthouse Manida on "Tambun" yet? Klick here if you didn't! 1. 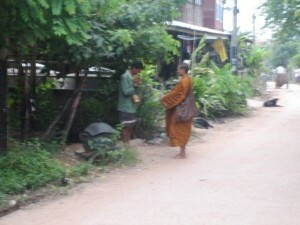 From 6 to 6.30 am one or more forest monks collect food and alms. They walk around the village and the people offer them food and sometimes money. You can just watch this or you can offer something yourself, a 20 Baht note is enough, or you can buy something in the local shop and put it in his bowl. 2. At 6.30 am there is a daily (water) ceremony in the local temple. People offer food (usually) or money (ocasionally). The 3 resident monks eat some of the food and the rest of the food is distributed among the needy of the village. If you want to offer something you can ask Manida for 3 envelopes in which you can put 100 Baht per envelope. You can offer this personelly to the monks. If you don't want to do this you can talk to Manida about offering food. 3. During one of your walks you can ask Manida for a personal cermony in the forest temple near Manida's family's fields. The very friendly monk will have a short conversation with you, will say prayers, do a ceremony specially for you and give you a rope bracelet. Your offer this time will be a specially prepared bucket with daily necessities and a 100 Baht note (minimum). Of course you can make extensive wishes for yourself, your friends and family.